Camden turned the Big 8 yesterday. 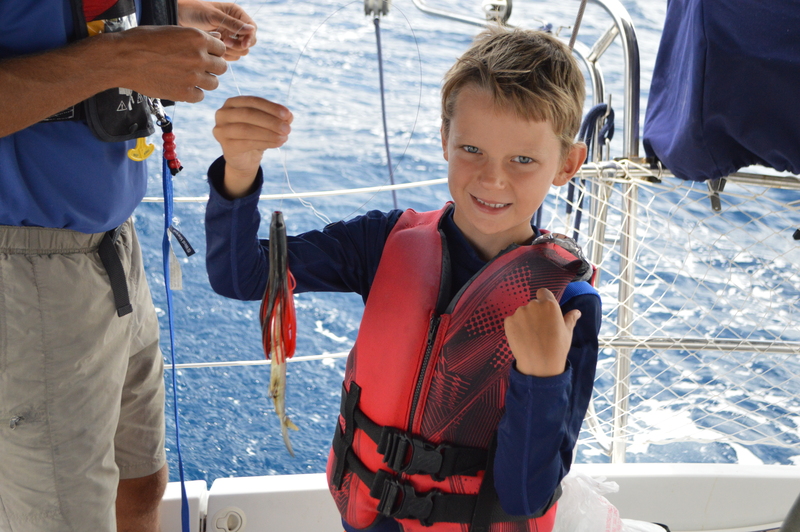 His only request for his birthday was to go deep sea fishing. No surprise there! Cam started the day by baking his cake with me and opening up presents. He got a Tervis Tumbler with the Hope Town lighthouse and fish on it. And he got this shirt which I’m sure he will never take off. After a quick bowl of Cheerios (and of course no homeschooling on a birthday), we took the dinghy over to a beach so Camden could do a little shore fishing. He was hoping to catch a pompano. 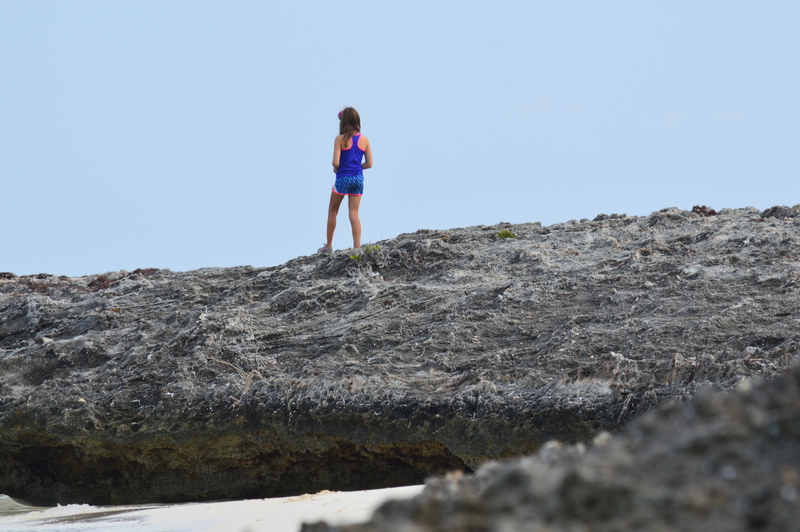 While Camden was fishing, Joellen was off exploring the rocks. Joellen needs more alone time than Camden and Maria, so when we get off the boat Joellen likes to have some time to herself. 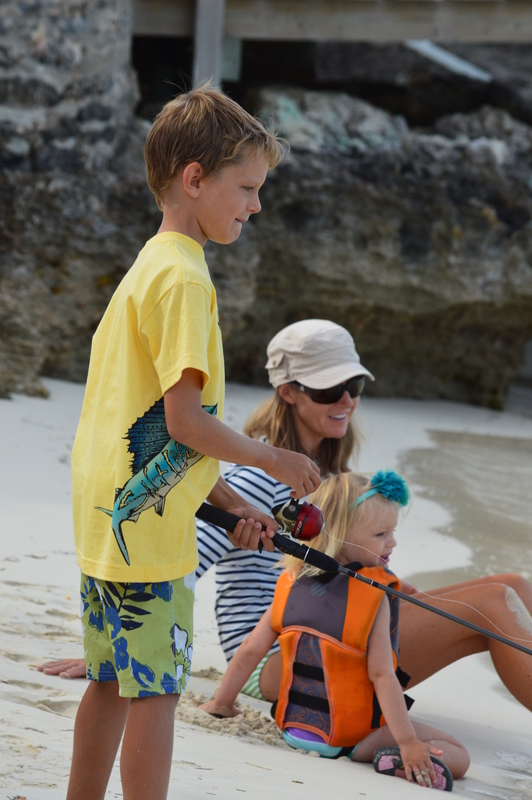 After an hour of no luck with fishing, Camden decided to join Joellen in the water and look for sand dollars. 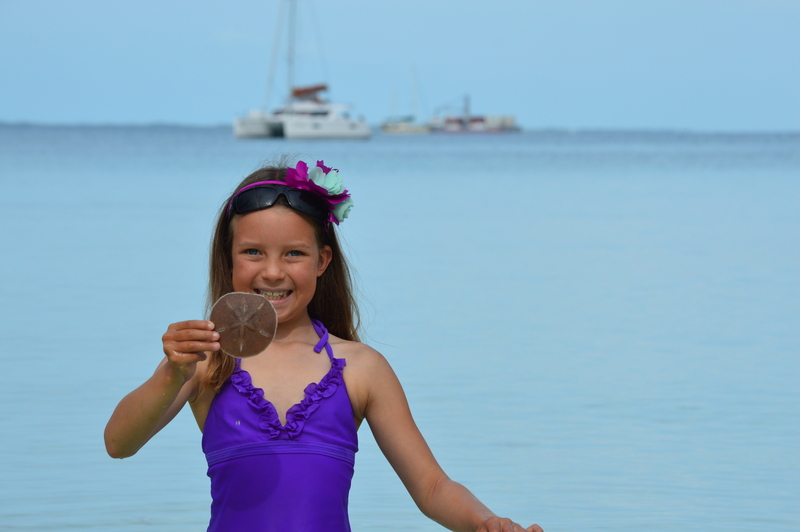 Joellen’s top goal of the trip has been to find a sand dollar. She has found plenty of sea biscuits but no sand dollars. Wiggling her toes in the sand, Joellen finally found one. 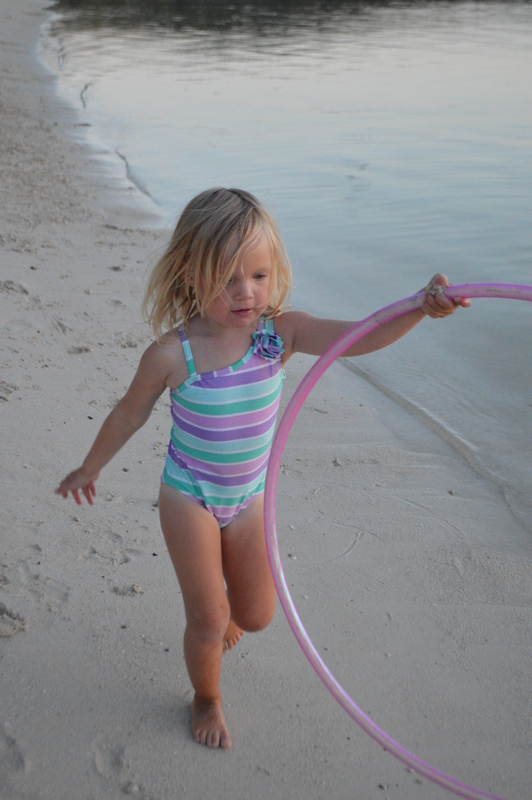 She used Camden for balance to pull the sand dollar up with her feet. Sweet success! 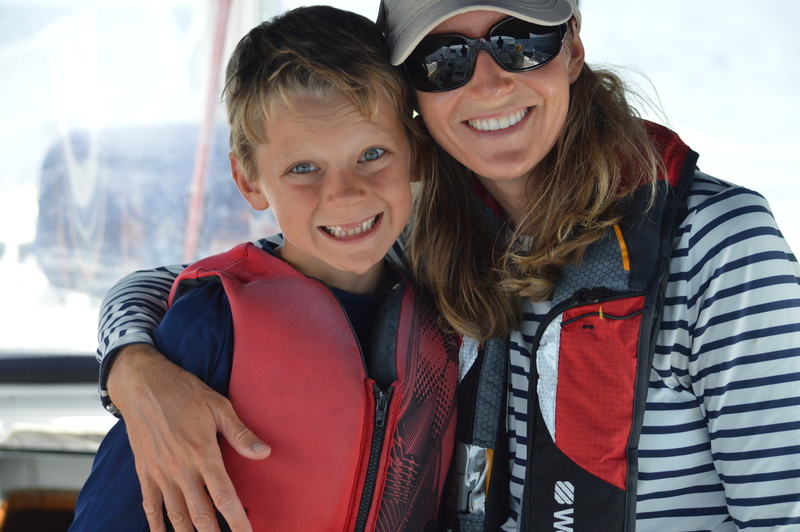 We all hopped back in the dinghy and rode back to the boat to head out to sea. 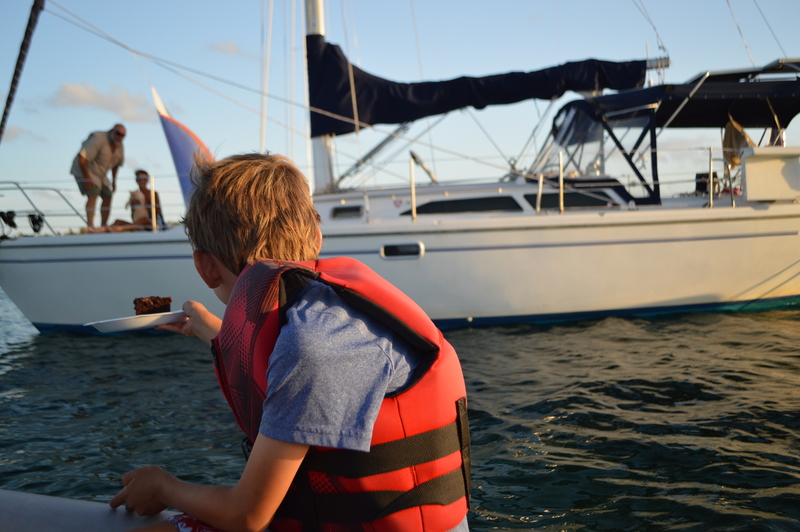 Camden really wanted to have cake out on the ocean while deep sea fishing. So we headed out of the Sea of Abaco through a cut into the Atlantic. 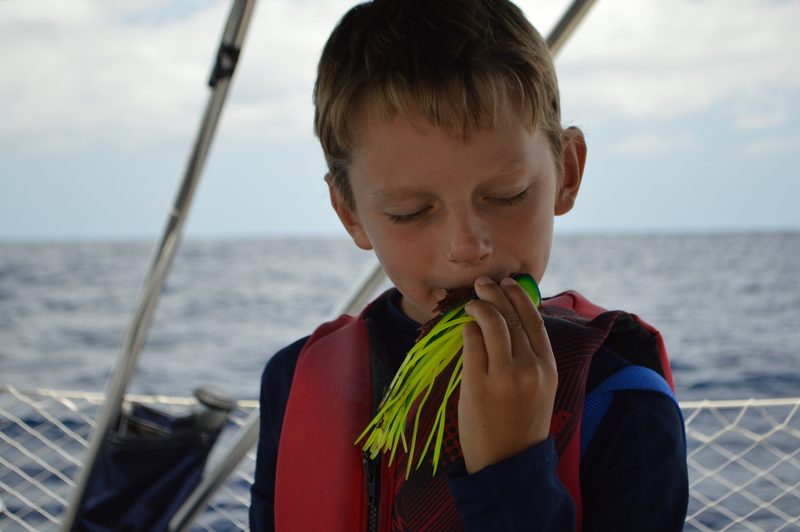 Marc and Camden put some stinky ballyhoo with a skirt on, hoping to entice some Mahi Mahi. After twenty minutes went by, the temptation of cake was too great so Camden asked for it to be cake time. 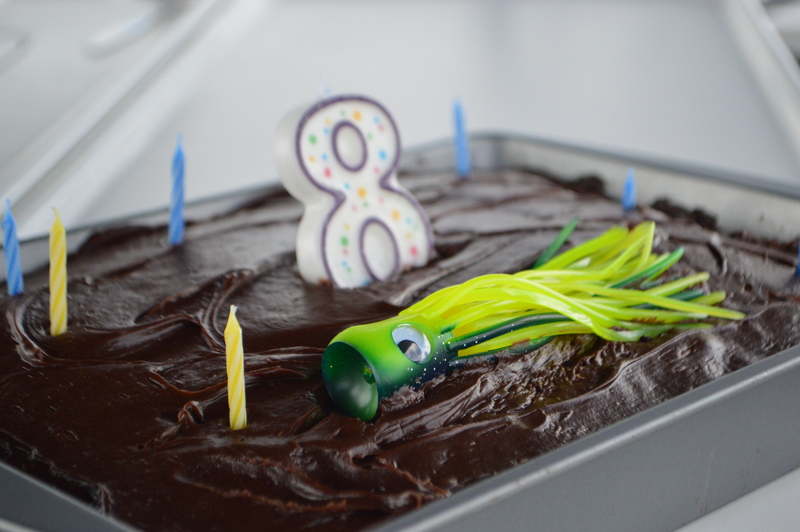 Camden came up with this idea to decorate his cake with a fishing lure. Because of the wind, the candles kept blowing out. So we had Camden sit under the dodger for a little wind protection. 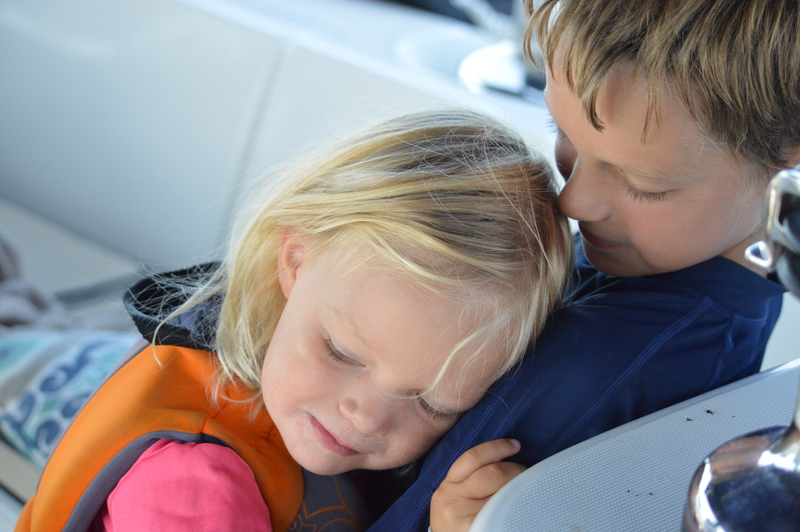 Unfortunately Camden did not catch any fish, but he did catch lots of hugs and kisses on his special day which made it all better. 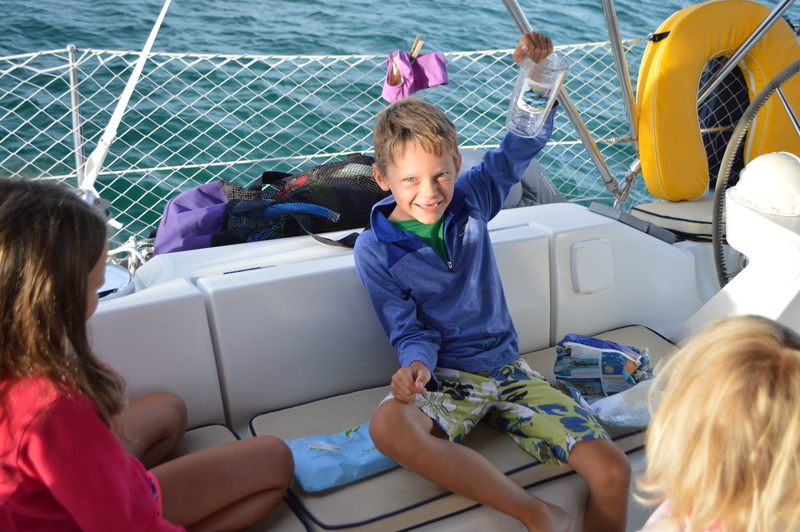 We sailed into Fisher’s Bay on Guana Cay in the late afternoon and dropped the hook. 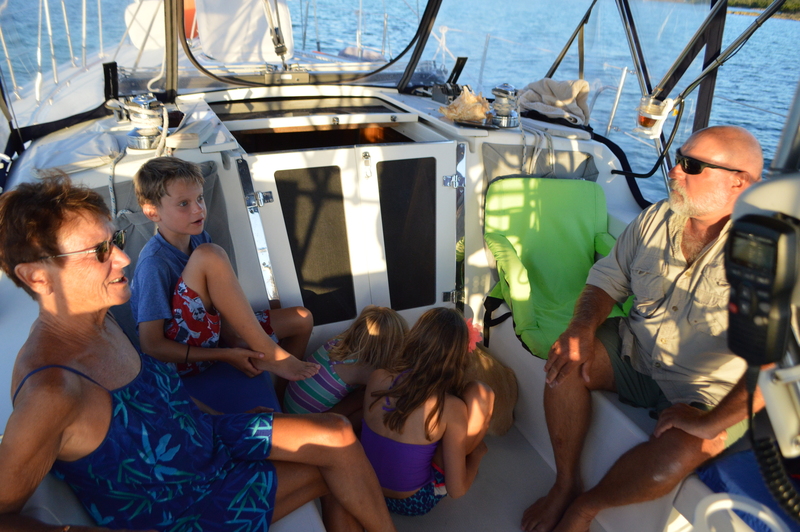 As we pulled into the anchorage, S/V Diva Di called over to us, “Marc, Jen and crew…hello!” We met Duane and Diane on Maria’s 3rd birthday down in the Exumas and they came to her birthday party. What a small world that we see them again and it is Camden’s birthday. 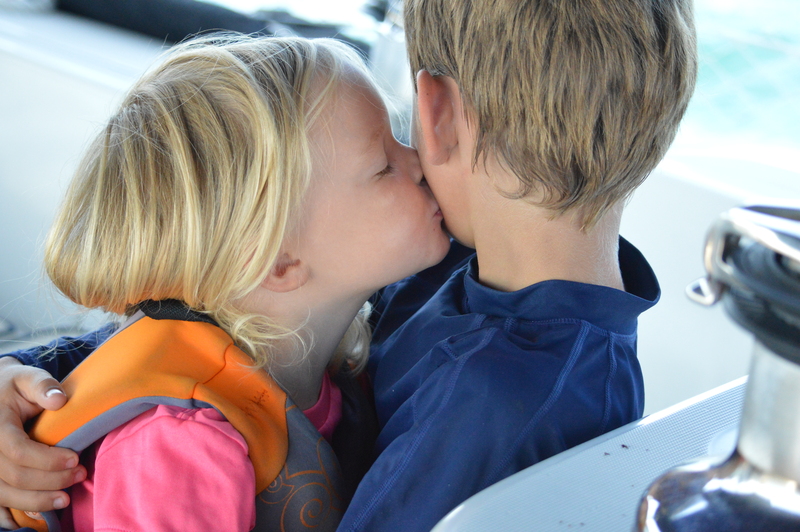 We just love this close knit cruising community. We told them we’d be right over and we cut a slice of b-day cake for them and hand delivered it. It was fun catching up with them and hearing about their adventures since we last saw them a month and a half ago. We then headed over to Grabbers, a fun restaurant/bar on the beach. 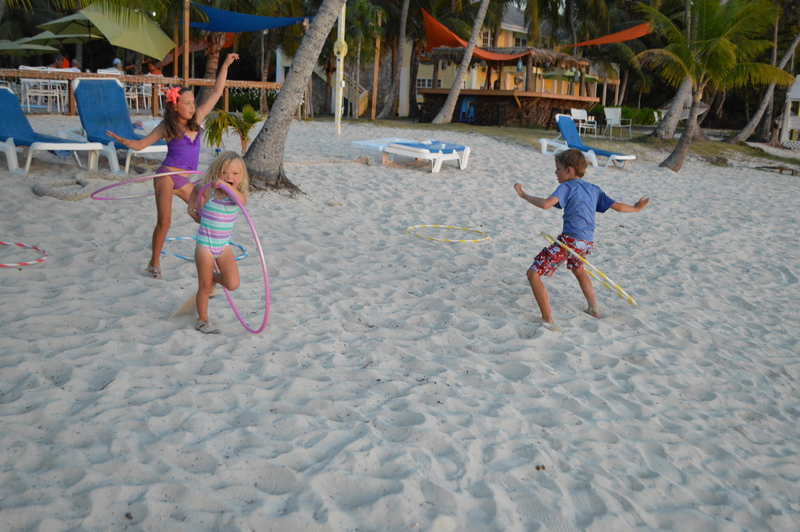 We were pleasantly surprised there was a pool, corn hole, hoola hoops, and a ring toss game. Talk about kid heaven. As the sun started to set, Marc and I decided it was time to call it a day and take our crew back to Adagio. Camden, we will never forget this special 8th birthday and we know you won’t either. You may be our wild one and our little negotiator, but we love your spirit and zest for life. As we always tell you, “You are so full of life.” We love you so much and you make every day a true adventure. 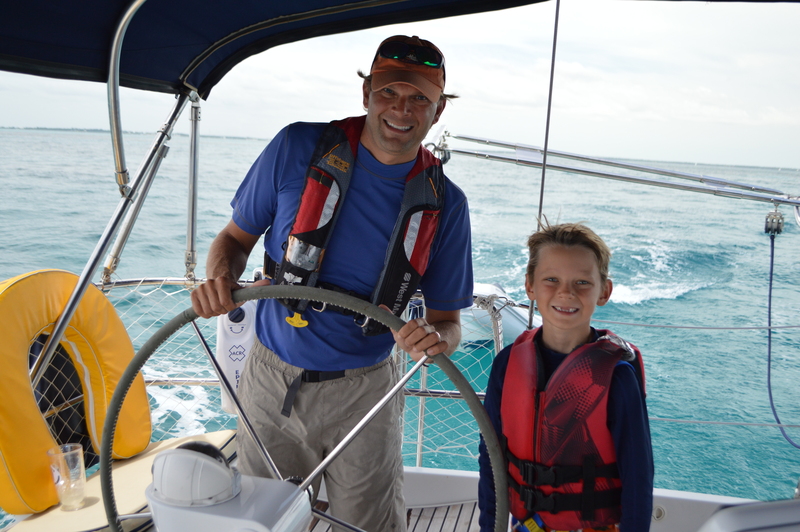 ← Boatschooling: What’s it Really Like? Happy Belated Birthday, Cam! Wow!! That was quite a birthday you had!! Marc and Jen, we love the website and all the great pictures! What a great family adventure you all are living. So glad to see so many smiles in all of these pictures! God has blessed you both and your family in so many ways. Our prayers continue for you all on your adventure. Hope you had a wonderful Father’s Day, Marc! God is Great and We Are Blessed! Happy Belated Birthday Cam!! 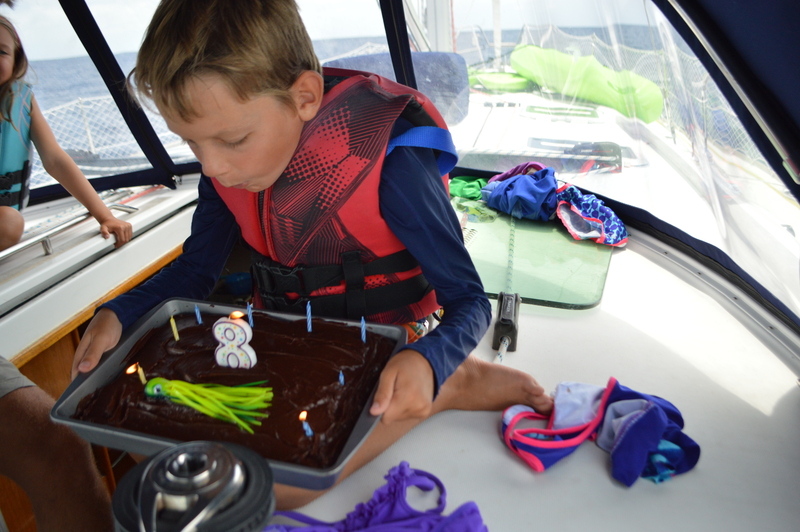 Fishing & yummy chocolate cake with hula hoops even – doesn’t get much better than that! Love your snazzy new shirt too. Looks like all of you enjoyed a sunny, happy day! 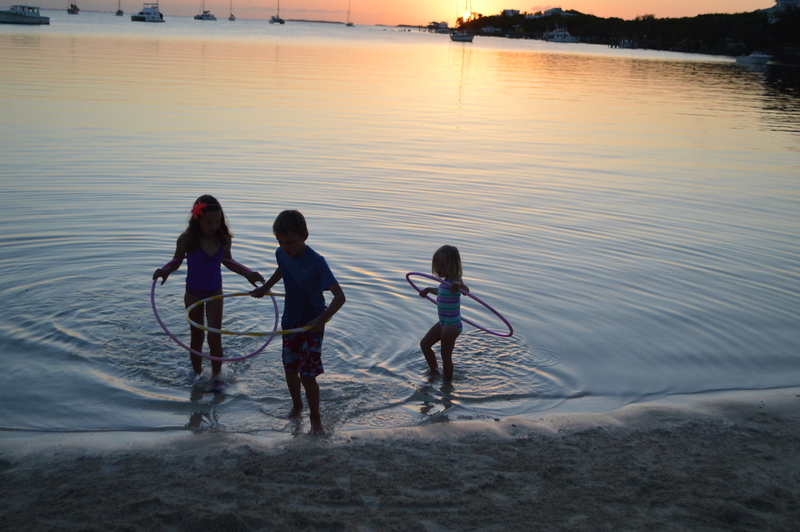 We love hearing about your adventures – thanks for sharing!! Now THAT is what I call a HAPPY BIRTHDAY!!! What beautiful memories! Sorry about the fish, I guess you’ll just have to keep fishing! 🙂 Congrats to Joellen on the sand dollar! It always feels so good to find something that you have been waiting for, how cool that Cam helped you retrieve it on his special day! Happy Birthday Cam! Check out your Dad’s facebook page…Anabel, Rachel, and Joey sent you a message with a picture! What a special birthday celebration for a special guy! Lots of action and surprises for an “action” guy. Isn’t God good to have planned such a day with a perfect sunset and games and guests? The hugs, kisses and cake deco are precious. Such character building times. Hope it works out to see you in Florida. Cute pictures!! Happy birthday Cam! You all look great! Happy Birthday Cam the Fishing Man ….Keep at it, you never know when the big one will hit! Happy Birthday bud! We were thinking of you on your big day and Bridget wanted to send you a card. Sounds like it was the perfect day. 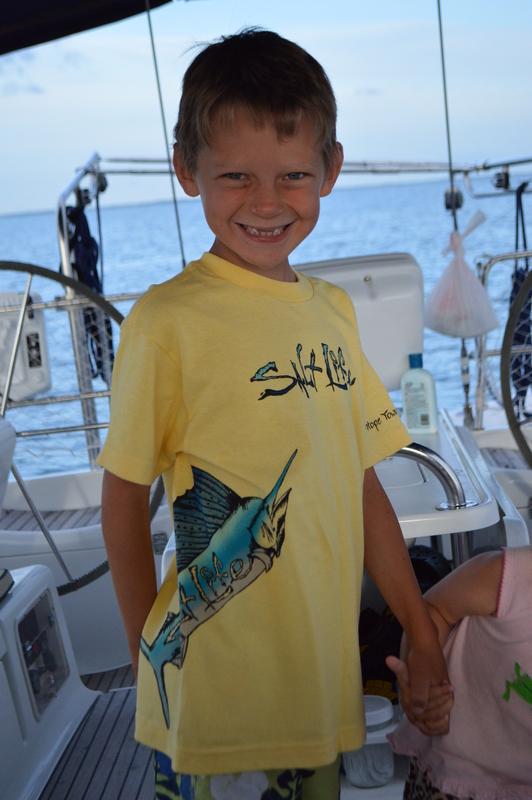 Love your new yellow fish shirt! You look just like your dad when he was your age in that picture- a little mini Marc. We miss you and wanted to send you a birthday wish across the miles! Joellen, I love how you always have a cute hair bow in. You look adorable in your purple suit. I miss your sweet hugs! Happy Birthday Cam! 8 truly looks great for you:). 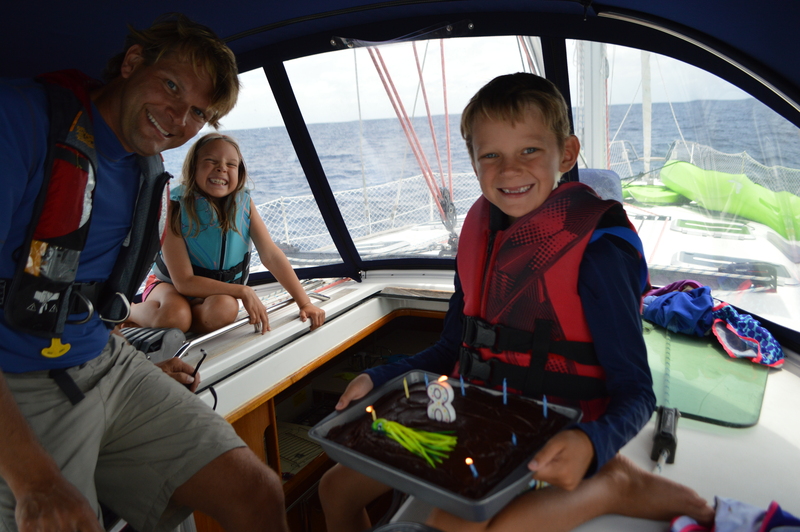 Enjoy your birthday at sea! Max is very jealous of all your great fishing time. Rochelle, great to hear from you. We actually were just talking about Max the other day. We miss you all.